I use it less and less, but I do have a Boot Camp* installed copy of Windows 7. And that may be awful. Windows running on one of them would be crazy small--it won't know about the super-small pixels. I know our Windows programs don't have 64x64 sized icons for toolbars on a retina display** :) Buttons will be minuscule, text will be unreadable; or you'll have to set to some 1/2 resolution setting so everything will instead be big and blocky. Either way, Mac OS will look great, and Windows will look like crap. * It was months ago, but I remember some idiot saying that Apple using some puns was a sign they were going down since Steve Jobs passing. "Boot Camp" is an excellent example of puns being used in product names under Steve Jobs. ** Most of our Windows program toolbars are 24x24, like everybody else's. 24x24 is exactly the size of one of the tiny icons inside a folder on iOS on an retina screen. Now the Macbook wouldn't be that high for Dots Per Inch, doing a little math: look at an iPhone screen, and imagine a toolbar button the size of the red square in the middle of this image. 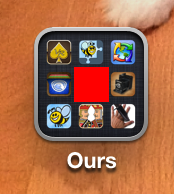 The icon plus some of the separator space--think you could click that with a mouse?